The new Prometheus trailer builds suspense for the highly anticipated film from renowned science-fiction director Ridley Scott. Prometheus is the latest film by Ridley Scott and sure to be a major summer blockbuster. Scott is arguably most famous for directing Alien (1979), Hannibal (2001) and Black Hawk Down (2001). His more recent work includes American Gangster (2007) and Body of Lies (2008). 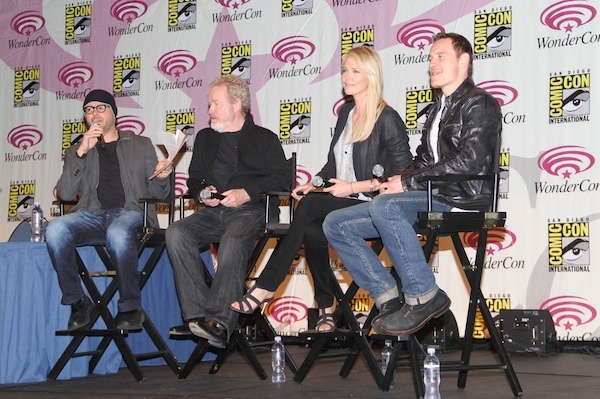 Prometheus stars Charlize Theron, Michael Fassbender, Guy Pearce and relative unknowns Noomi Rapace and Patrick Wilson. Described as science fiction horror, the new trailer reveals next to nothing about the film but succeeds in building anticipation for the movie. Prometheus is written by Lost co-creator Damon Lindelof, which may explain the scarce plot details. The trailer opens like the retelling of an epic story with what sounds like Charlize Theron: “A king has his reign and then he dies. It’s inevitable.” From here a team of explorers is shown in cool, futuristic spaceships and using advanced technology to discuss the similarities between ancient civilizations separated by thousands of years. The team decides to explore — it’s not clear where exactly but presumably some distant planet — based on hieroglyphic messages. Some members of the team feel it’s an invitation and the trailer does a great job of illustrating its ominous tones. The preview ends with the team discovering an unknown life and struggling to return to Earth. If the name Prometheus sounds vaguely familiar, Greek mythology holds that Prometheus was a Greek god who gave fire to mortals only to be punished by Zeus for eternity. Yikes. We’re not sure yet if there are any similarities, but clearly Scott is trying to send a message. Prometheus opens in theatres and IMAX on June 8, 2012.